With the first rays of the rising sun the miners go down so deep in the coal mine, their voice are stifled in the bowels of the earth-even in their wildest dreams they cannot escape to reach out to the reality above the ground. When disaster strikes - there are 3 men that stand up to fight for these labourers who take death as part and parcel of their existence. Vijay (Amitabh Bachchan) an ex-naval officer who is court-martialled and dismissed from the navy. Vijay is now working at the coal mine. He welcomes every sign of danger and adversity in an attempt to combat the demons within and to pay for an act of cowardliness as the captain of a sinking ship. Ravi (Shashi Kapoor) is an engineer in-charge of this doomed project, due to the negligence and the greed of its owners. Ravi tries to alert the management and the workers. Ravi joins forces with the workers and Vijay in order to save the lives of his fellow workers and fight the establishment. Mangal (Shatrughan Sinha) is runaway convict who finds shelter from the hands of the law at the coal mine. A boisterous and egoaistic man, who finds that there is a compassionate human being within him and also ends up joining the quest for justice. 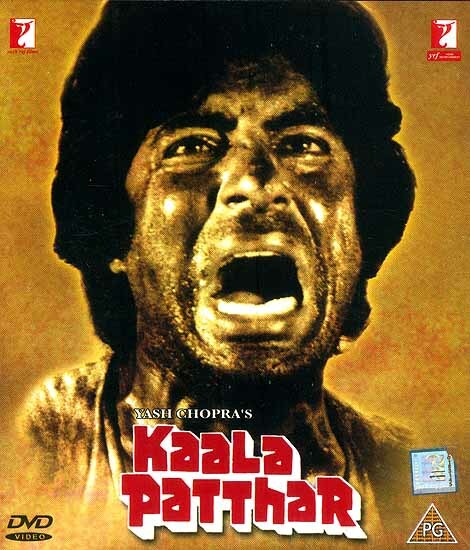 Kaala Pathar is a film about how different people from different walks of life and backgrounds come together and show true courage and character, to fight the forces of nature in what is a loosing battle. Single Disc Fullscreen Presentation, Enhanced 5.1 Dolby Digital Sound, Optional Subtitles: English/Bengali/Gujrati/Tamil/ Telugu/Kannada/Malayalam.